This high quality dragonfly black cast iron tea set is the perfect companion for enjoying tea. The dragonfly design symbolizes good fortune. This classical tea set is made from sturdy iron and has enamel coating on the interior to prevent rusting. Cast ironware heats evenly and retains heat well and is praised worldwide for their beauty, strength, and superb quality. Please note that cast iron teapots should not be used directly on stovetops to heat water. 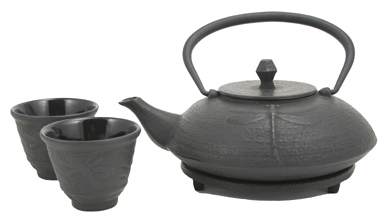 Historically during the mid 19th century as infused tea drinking became more popular in Japan, tetsubin or iron cast teapot evolved from being a kitchen item to being a status symbol used to serve tea. Many nobles cherish their teapots as treasures and are kept in the family for generations.